Happy first day of Summer! It is our mission to offer full-service design, installation and maintenance of extraordinary living environments. We offer these services always with integrity and quality for our customers, while utilizing safe and horticulturally sound practices for our world! We have put together a list of our services to help show the scope of our business, expertise and offerings. Design Service : In generating a landscape design for our customers, we consider much more than just creating a beautiful environment. Hutcheson’s design team will produce a customized plan for each homeowner’s specific needs. 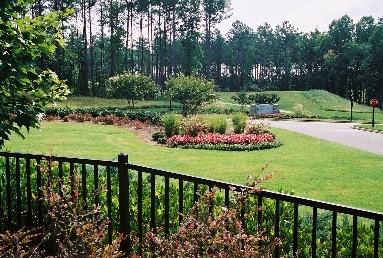 Whether it is drainage issues, maintenance requirements, elevation changes or aesthetics, our design concepts will encompass a relevant solution to each problem while incorporating a professional eye for a beautifully balanced landscape. Installation : We offer landscapes, hardscapes, and a fully functional irrigation system will help protect your landscape investment as well as conserve water. Enhancements: Custom Pools: Let the Hutcheson Pool Professionals create the backyard oasis you have always wanted. Custom pools in Atlanta with beautiful landscaping and hardscapes is our specialty. Lighting: Transform your home or facility into a spectacular showplace at night with Hutcheson’s professional outdoor lighting service. Not only will illumination enhance the beauty of your home and garden, it also increases security and reduces risks around walkways, decks, pools and other landscape features. Floriculture: The vibrant color, texture and fragrance that flowers provide in a landscape is why floriculture is one of our most popular enhancements. Whether you desire a large perennial garden or a few annual color beds, our experts are here to help. Also, be sure to follow along on Facebook , Google+, and Twitter!